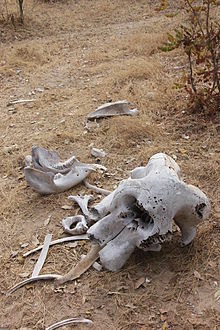 An elephants' graveyard (also written elephant graveyard or elephant's graveyard) is a mythical place where, according to legend, older elephants instinctively direct themselves when they reach a certain age. They would then die there alone, far from the group. Several theories are given about the myth's origin. One theory involves people finding groups of elephant skeletons together, or observing old elephants and skeletons in the same habitat. Others suggest the term may spring from group die-offs, such as one excavated in Saxony-Anhalt, which had 27 Palaeoloxodon antiquus skeletons. In that particular case, the tusks of the skeletons were missing, which indicated either hunters killed a group of elephants in one spot, or else opportunistic scavengers removed the tusks from a natural die-off. Other theories focus on elephant behaviour during lean times, suggesting starving elephants gather in places where finding food is easier, and subsequently die there. The myth was popularised in films such as Trader Horn and MGM's Tarzan movies, in which groups of greedy explorers attempt to locate the elephants' graveyard, on the fictional Mutia Escarpment, in search of its riches of ivory. Osamu Tezuka's Kimba the White Lion episode "A Friend in Deed" centred around it. More recently, the 1994 Disney animated film The Lion King; as well as the Broadway/West End musical adaptation; referred to the motif. In "Fearful Symmetry," an episode from The X-Files which revolves around a mysterious invisible elephant, a character refers to the mythical concept as fact. Prolific elephant hunter Walter "Karamojo" Bell discounted the idea of the elephant's graveyard, stating that bones and "tusks were still lying about in the bush where they had lain for years". In geology, "elephants' graveyard" is an informal term for a hypothetical accumulation of "large blocks of country rock stoped from the roofs of batholiths". In military settings, it is sometimes used as a slang term to describe postings or assignments for senior officers for whom there is no potential for further promotion. In Spain, the Spanish Senate is often criticised as a cementerio de elefantes where politicians who have lost their previous positions end up doing no productive work. It is a term for the offices and a secretary provided to former high-ranking executives of large companies (at least in the United States), who have either retired or resigned. An executive who relinquishes or is relieved of authority becomes a consultant (special adviser) where they continue to receive a salary and an office under their contract but have little or no actual responsibilities, until their non-compete agreement expires. ^ Young, Rory (November 15, 2013). "Do Elephant Graveyards Exist?". Slate. Retrieved February 3, 2018. ^ Armitage, Kenneth B.; Buss, Irven O. (March 1992). "The Great Beast — Elephant Life: Fifteen Years of High Population Density". BioScience. BioScience, Vol. 42, No. 3. 42 (3): 196–197. doi:10.2307/1311827. JSTOR 1311827. ^ Brühl, Enrico; Mania, Dietrich (22–25 September 2003). "Neumark-Nord: a middle Pleistocene lake shore with synchronous sites of different functional character". Données récentes sur les modalités de peuplement en Europe au Paléolithique inférieur et moyen. Rennes: Université de Rennes. ^ Earnhart, Brady (1 July 2007). "A Colony of the Imagination: Vicarious Spectatorship in MGM's Early Tarzan Talkies". Quarterly Review of Film and Video. 24 (4): 341–352. doi:10.1080/10509200500526778. ^ Bell, Walter (1949). Karamojo Safari. Harcourt, Brace. p. 26. ISBN 1-57157-358-5. ^ Clarke, D. Barrie; Henry, Andrew S.; White, Mary Anne (10 September 1998). "Exploding xenoliths and the absence of 'elephants' graveyards' in granite batholiths". Journal of Structural Geology. 20 (9–10): 1325–1343. doi:10.1016/S0191-8141(98)00082-0. ^ (in Spanish) PP y PSOE se echan en cara que utilicen el Senado como cementerio de elefantes, Juan Carlos Merino, 7 July 2015, La Vanguardia. ^ Dominus, Susan (October 3, 2012). "The Woman Who Took the Fall for JPMorgan Chase". New York Times. Retrieved May 9, 2016. This page was last edited on 14 March 2019, at 23:25 (UTC).